If you really want a Kick Serve with Bite and Bounce you are gonna be so happy you watched today’s video. I am gonna really take my time and teach you how to finally master that elusive kick and point out how some general tips can be misunderstood or incomplete which is probably the reason your still struggling. And the Best Part is…the fix does not have anything to do with skill, athleticism, or strength. Anyone can get this…especially when you follow my 3 X Approach and the Drills I am going to give you at the end of this video. Why Is It Important to Learn a Kick Serve? Before I explain how to hit a better kick serve, I want to explain why it is important to spend time and effort developing a kick serve. What does a GOOD KICK SERVE do? A good kick serve lands in the service box and rebounds high off the bounce. An effective kick serve will hit the court and bounce over the opponents shoulders making it difficult for them to control the ball or get any power on the ball. The result is you will end up getting FREE points and easy second ball put away opportunities. How to Hit a Good Kick Serve? In today’s Video we focus on 5 technical components that will help you improve that kick serve! Grip- You must have a continental grip if you want to master the kick serve. Beginner serve grips that I refer to as the hammer grip will not work! I even suggest you go into an extreme continental or eastern backhand grip to create MORE spin. 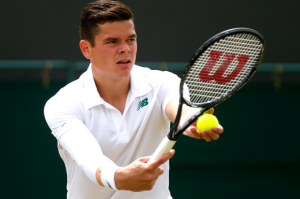 I like to use Milos Roanic serve grip as a great visual to explain what I mean. 2. Stance- The stance is often overlooked on the kick serve, but I think it is extremely important. The proper stance will help you get extra rotation in the hips, core, and shoulders without having to work at it. 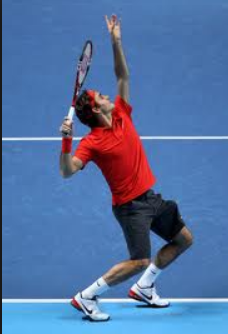 Take a look at the foot position of Roger Federer who has an underrated kick serve and you will notice that his back foot in just outside his front foot. By setting up this way Roger has set himself to naturally uncoil his body towards his intended target. 3. Toss- The kick serve toss is KEY!!! If you get this wrong it almost makes it impossible to hit an effective kick serve. You want that toss over the crown of the head. The reason is you want to hit a different ball of the ball than all your other serves and have a different swing path which we will discuss in a minute. On a kick serve you want to aim for the inside bottom of the ball and swing up and across the tennis ball. 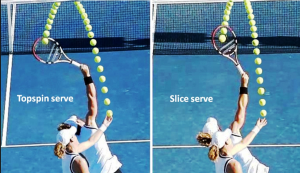 Notice the difference of the racket face on contact when you compare a Kick Serve to a Flat serve. 4. Swing Path- The swing path is the secret sauce to the kick serve. Once you can feel it, you are in it to win it!!! The opposite feeling of a kick serve is a flat serve which feels like hitting a nail squarely into a wall. With a kick serve it almost feels like you are playing a game of chicken with the tennis ball. Like you are almost trying to miss contact with the ball! Rather then swinging forward, through the ball, and extending across the baseline, on a kick serve you are swinging up, and swinging almost parallel to the baseline with while the racket head is still moving forward across the baseline but not as far as a flat serve. Sam Stosur gives a perfect example in this video. 5. The Follow Through- Most players end up curling around the tennis ball too much which results in a slice serve, even though they were intending to hit a kick serve! If you feel this is happening to you then you might want to consider my pass the baton follow through. This will make sure you break off the ball at the correct time to add a kick serve effect to the tennis ball, rather then a curving slice serve. Here is a picture that demonstrates the pass the baton follow through. 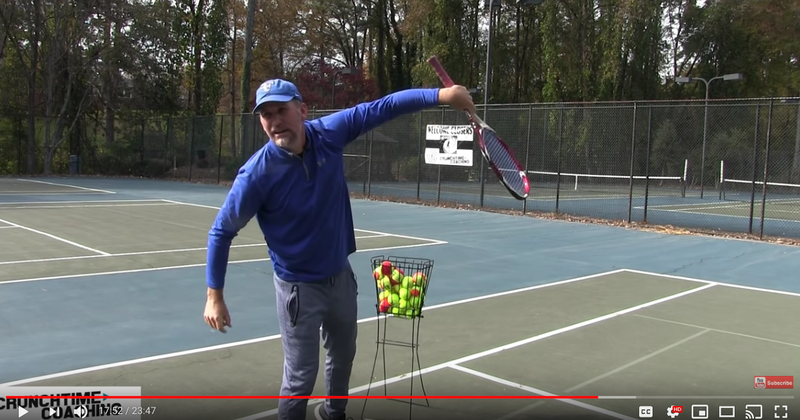 If you follow these steps plus my 3 x Kick Serve drill that I demonstrate in today’s video lesson your success is pretty much a guarantee! 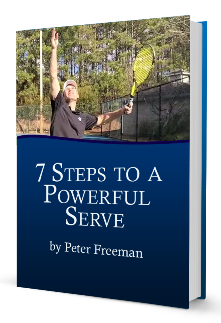 Want MORE KICK SERVE TRAINING?